People nowadays have became aware of negative impacts from increasing air pollution, natural disaster, food supply industry … whereas population has rapidly increased in recent years, which has inevitably lead to urbanisation over the globe, with a far-fetching speed as a consequence. However, this overpopulation is a natural cause that necessarily demands ever larger living space. It prompts a question of how to resolve it economically & effectively. Therefore, urban planning // re-development, transportation & interconnecting cities plays a crucial role in revamping the city’s structure that could settle the issue of over population following rapid urbanisation. So the question is how one retain the economy of (living) space on earth, whereas the number of people are ever increasing over the time. 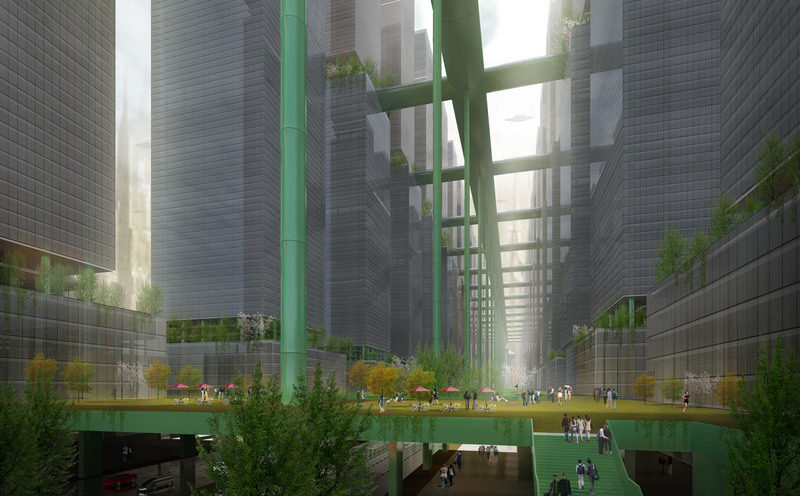 Our answer is to build a centralised urban space, and extend it vertically. This is an apparent solution that could both generate more space within a same square mile, as proven in big cities like New York, Tokyo, …etc. - Pressure for urban infrastructure. - Pressure for transportation system on the ground & underground. - Lack of communal / public space & amenities for those living half way up. - only 1 access point & fire-exit. All travel means are on vertical axis. - the urban infrastructure are mainly on/near the ground. - Public amenities mostly locate on lower levels & on the ground, together with traffic connection as well as public means of transport - i.e. road users have to travel all the way down in order to reach their means of travel, creating vertical gridlock in these buildings in rush hours. 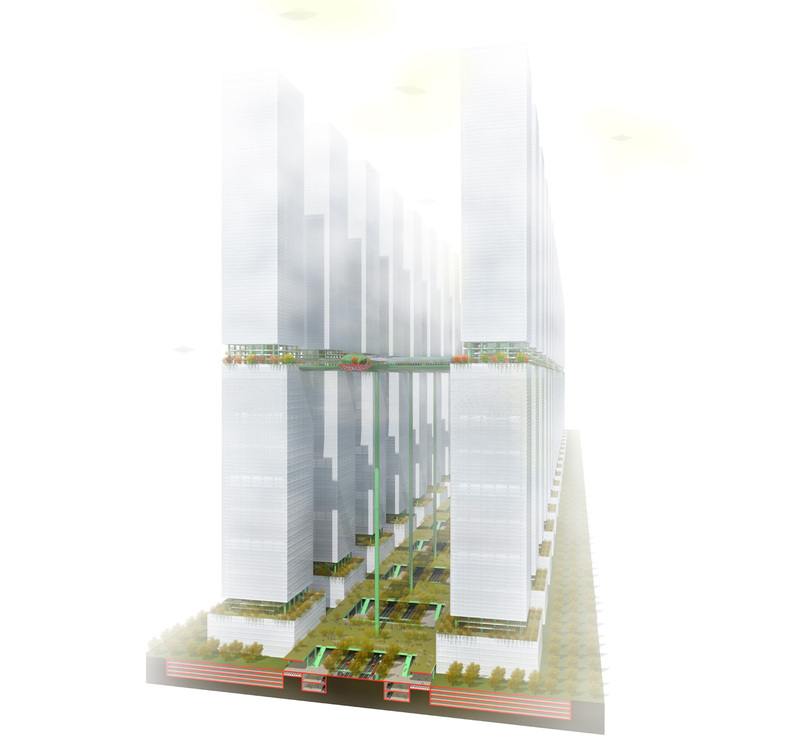 A second infrastructure that connect with the upper halves of super-tall skyscrapers. A network for exit - routes from above. A separately functioned public amenities, indoor / outdoor recreational space. The traffic system for driverless vehicles on this ground connects buildings with expressway on viaducts that conjunct at (multiple) connection points. These nodes connect traffic network on the 1st ground with the 2nd, and also functioned as air traffic control stations or terminals for private aircrafts in the future. In response to the advancement in automotive industry, it is better to build a new urban infrastructure, which integrate interactive technologies onto the road system to operate different vehicles, as future technology advance might further require. The second infrastructure is runs parallel with the new road system. 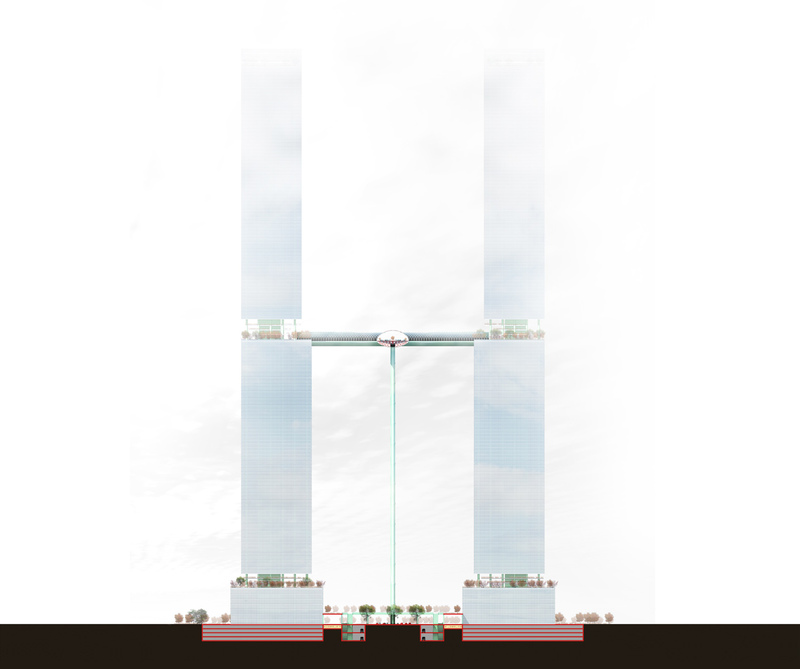 This divides up the pressure for the infrastructure by joining with the upper-half structure of the sky-scrapers [ above second ground ], which we suggest 250m - 300m height. “The second ground” also allows safe exit routes without having to in-building exit - disperse the flow of people in different directions, enhance safety for these buildings. 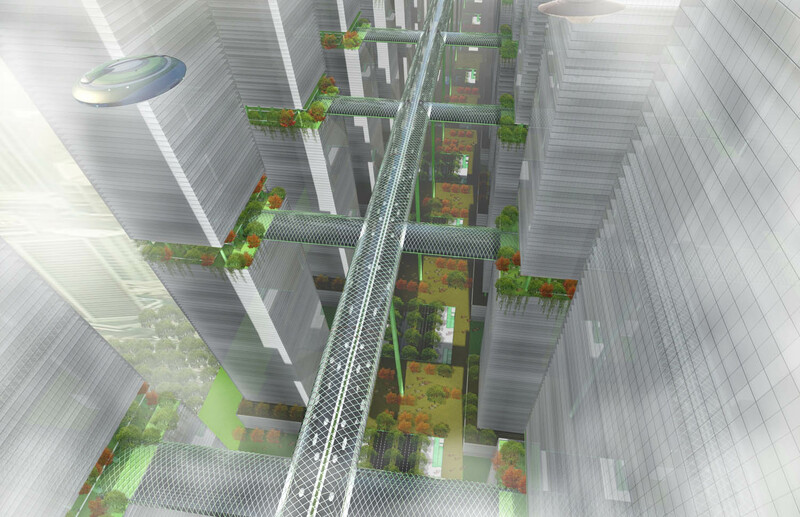 In order to resolve this, we design a transportation system that connects all sky-scrapers at second ground. Inside each supporting column ( made of carbon fiber reinforced composite ) provides a fast exit route down to the ground. On this "2nd ground", we suggest other groups of public amenities for locals living half way up the buildings. This arrangement could help saving time & travel distance, fuel costs, especially when vehicles are being operated. We suggest a structure for transportation system & infrastructure for the second ground that resembles bridge structures, that supporting columns could increase in numbers. These columns / towers, made of carbon fiber reinforced composite, also resemble bamboo structure - the hollow cylinder-form stems jointed together makes it easier to manufacture & build. 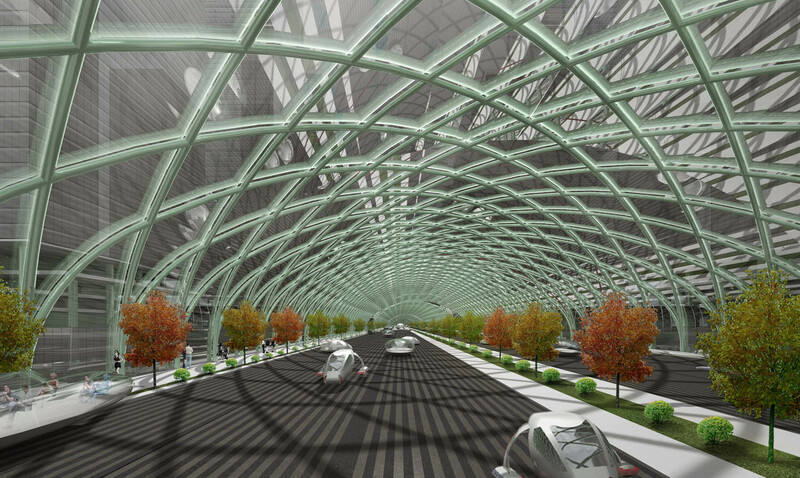 Section of each wing that accommodate road system is an (horizontal) ellipse in order to reduce wind pressure. Inside each tower placed an exit stair, leading to the ground.